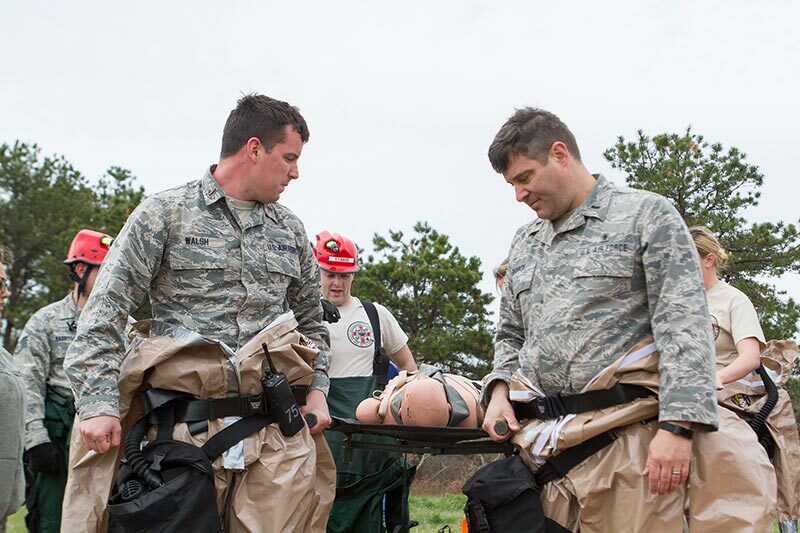 Military tests its ability to set up triage in case of emergency. 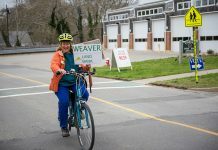 They loaded their vans and trucks onto the Steamship Authority ferry and climbed up the stairs in their camouflage uniforms to sit among the morning commuters to Martha’s Vineyard. Not your typical sight on the Island Home. “We got some strange looks,” said Master Sgt. 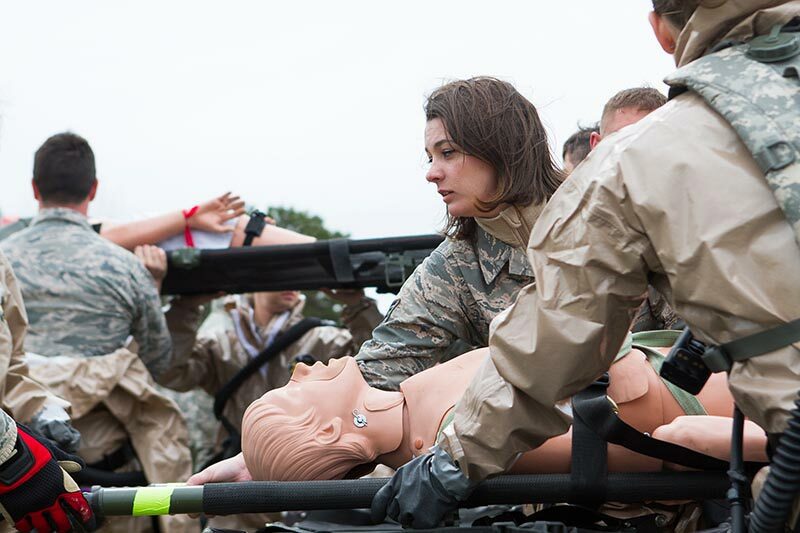 Cynthia Thomas, superintendent of a specialized medical unit for the 102nd Intelligence Wing at Joint Base Cape Cod. It looked like an Island invasion by the Massachusetts Air National Guard, but the ferry ride and the logistics surrounding it were actually part of an emergency drill staged at the Martha’s Vineyard Airport. If there was an emergency on the Island, like a hurricane with mass casualties or a chemical spill, the Guard unit might be called in to help with injuries. “We have 90 minutes to come in, set up our [four] tents, and start seeing patients,” Lieut. Col. Robert Driscoll, commander of the unit, said. Mr. Driscoll is a firefighter in Melrose when he isn’t doing his duty for the Guard, the state’s citizen army. 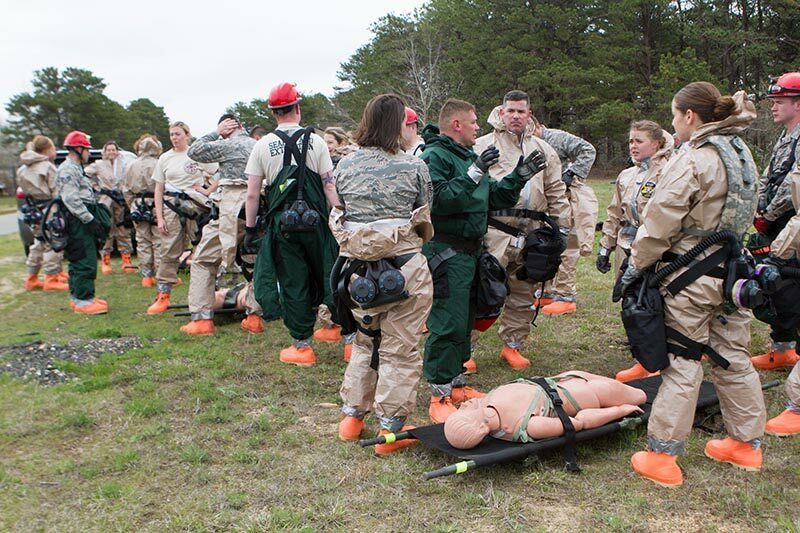 The unit came to Martha’s Vineyard to test its skills in a simulation (think naked crash test dummies with missing limbs), something it does as many as four times per year. On Friday morning, they were testing the 47-member unit’s response to a scenario that included a collapsed building. 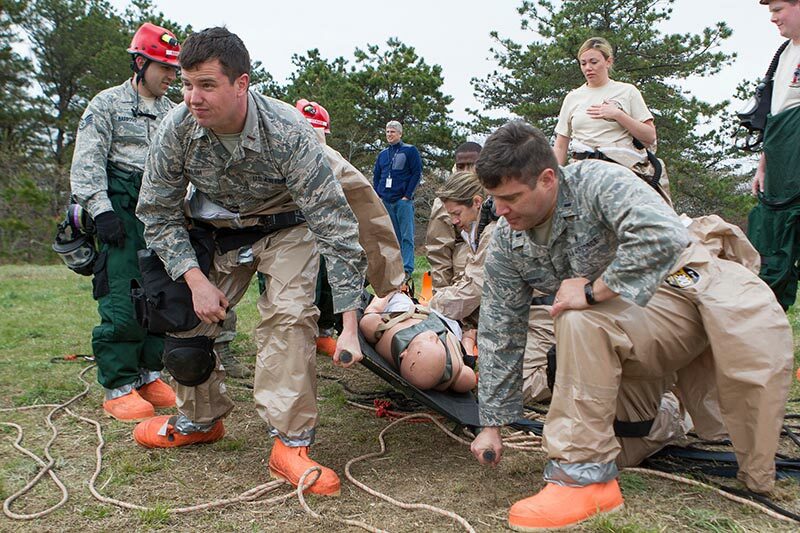 It’s important training, because the airmen and women dress in Tyvek suits and masks while performing rescues, which can add to their fatigue. One of the four tests is used to constantly evaluate the condition of the caregivers, Mr. Driscoll said. 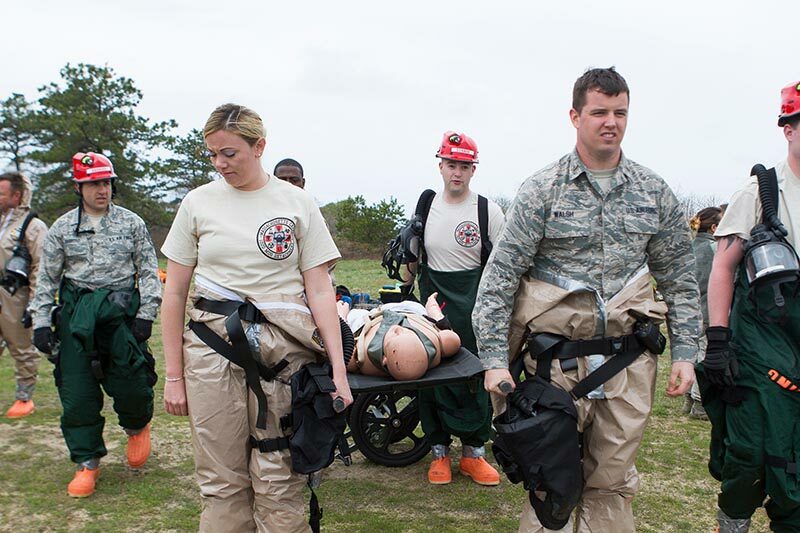 The unit, which can be called out by the Massachusetts Emergency Management Agency (MEMA) or the Federal Emergency Management Agency (FEMA), are a collection of doctors, nurses, and firefighter/EMTs by day, Mr. Driscoll said. Only two of them are full-time military. “All of the people here are people who want to be in this unit,” said Capt. Keith Foster, who works as a critical-care nurse for anesthesia at University of Massachusetts Medical Center in Worcester. There are 27 other similar teams across the country. “We’re the first to take a ferry to an island,” Ms. Thomas said. 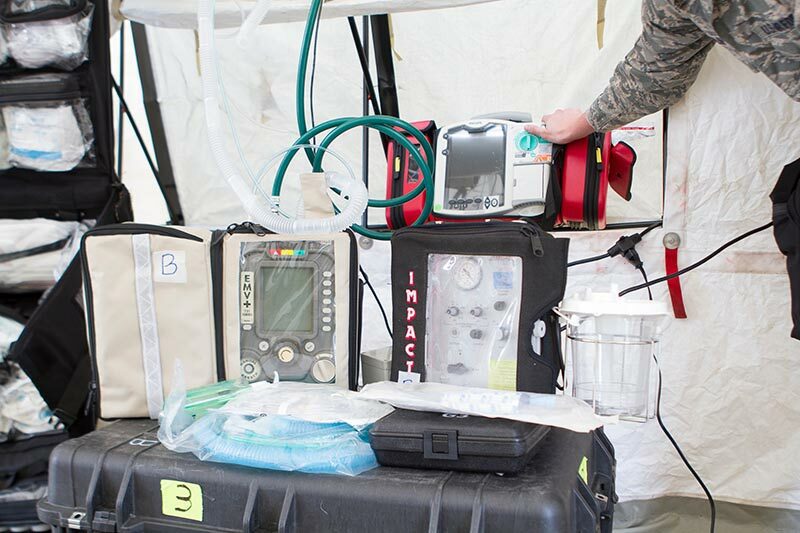 Their tents are equipped to treat critically injured patients in climate-controlled areas. Once patients are stabilized, those who need further care are taken to a local hospital by ambulance. Though the unit has never been deployed for a disaster, it’s had a regular assignment since the Boston Marathon bombings in 2013. 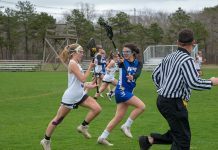 Every year, the unit is deployed at the starting line in Hopkinton, and is available should there be incidents along the route, Mr. Driscoll said. Martha’s Vineyard Airport played host to the unit on Friday. The airport has to do emergency training of its own, so this was good preparation for that, Geoffrey Freeman, the assistant airport manager, told the Times. The airport is an ideal location for the training because it’s fenced in, and should there be an actual disaster, the setting would give the Guard the ability to airlift patients off-Island, he said. “We welcome them and look forward to working with them,” Mr. Freeman said.